Each week, Dr. Chris Magryta from Salisbury Pediatric Associates, PA sends out a Health and Wellness newsletter. 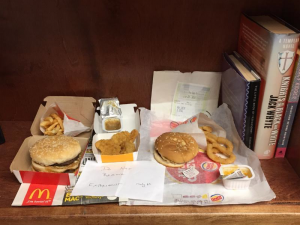 We had to share this one on his fast food experiment. To sign-up for Dr. Magryta’s newsletters and to read archived newsletters, jump over to their website. One year ago on July 8th I purchased a Big Mac, Whopper, chicken nuggets, french fries and onion rings from McDonalds and Burger King. After all of this time the food continues to live on in a dried and not decomposed state. To me, this is a commentary on the quality of the food provided by some fast food companies. The volume of preservatives involved appears to be enough to sustain these foods indefinitely. You have to judge for yourself if you wish to consume foods that can live on indefinitely. Enroll in our participant pool!